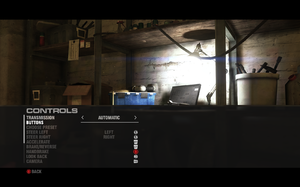 The game features full keyboard support but a controller is recommended. Some users have reported loss of Racenet connectivity and game save failures as a result of renaming or deleting the video files. Steam will re-download this file if you verify integrity so you will need to repeat the process. Regardless of where the game is installed, the Windows version will attempt to use the %PROGRAMDATA% area to store the in-game replays. The game will work with a Windows NTFS junction point, allowing the folder to be mapped to alternate locations/drives. Up to 8x MSAA, CMAA. Specify the base installation folder. Set the vertical FOV and enable the desired cameras. Make sure that "chase close reverse", "chase far reverse", "head cam", and "head cam reverse" are always disabled. Also do NOT adjust any of the "head offset" and "head tilt change" settings. Click on start to apply the changes. Only menu music and speech can be fully muted, the other options do not allow you to go below half. Menu music, effects, engines, speech. 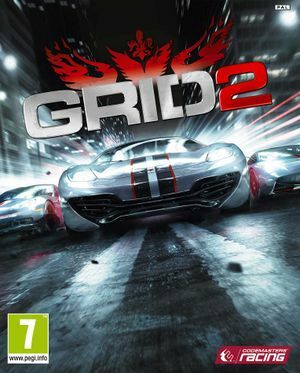 See Helix Mod: GRID 2. RaceNet online features require a Codemasters Account. Users are reporting that the game is crashing randomly during loading screens. There is currently no known fix. Users are reporting a variety of issues with Logitech Gxx peripherals. There is currently no known fix. Users are reporting an issue with the minimap not being displayed during a race. Codemasters has stated they are working on a fix and it will be released shortly. Steam will re-download missing files if you verify integrity so you will need to repeat the process. 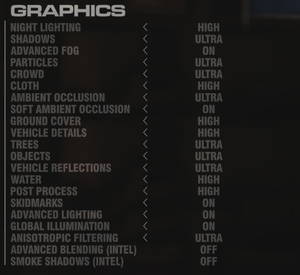 GRID 2 Mods - Collection of released modifications. Cockpit Cam Mod - Available for all vehicles (except DLC), works online and the only prominent issue being the blurry dashboard. ATI Radeon X1xxx/HD2xxx series, Intel GMA series and HD3000, Nvidia 7xxx/8xxx/9xxx series and 1xxM/3xxM series are not supported. ↑ 1.0 1.1 File/folder structure within this directory reflects the path(s) listed for Windows and/or Steam game data (use Wine regedit to access Windows registry paths). Games with Steam Cloud support may store data in ~/.steam/steam/userdata/<user-id>/44350/ in addition to or instead of this directory. The app ID (44350) may differ in some cases. Treat backslashes as forward slashes. See the glossary page for details.